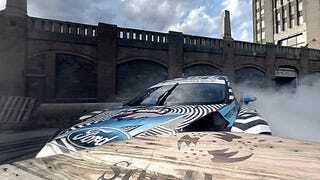 The first installment of the promised virtual reality version of Ken Block’s hoontacular spectacular Gymkhana Nine video is finally here. If you were wondering how some of the crazier stunts were done, Gymkhana Nine VR is your chance to stand right in the middle of the action and find out. This virtual reality, behind-the-scenes version of Buffalo-based Gymkhana Nine is now up on YouTube as well as in the FordVR app for iOS and Android. Yes—Block explains how they did that breathtakingly close jump in front of a train. It’s short, but sweet, and lets you see the crews behind the film as well. On YouTube, move the arrows around to get a whole new perspective on some of Block’s most ridiculous stunts. Or, if you have the app, just move your head. Welcome to the future, as they say. Block explains that his Focus RS RX was brand new to him at the time, and it took a while for him to get used to the car’s additional grip. Fortunately, it appears as though he figured out how to break the tires loose and spin them into smoke, noise and dust anyway. Aren’t we glad? Part Two drops in the coming weeks, and is bound to give away even more secrets of the hoon.